Sad news today coming out of Emeryville. Daniel Gerson, screenwriter on Pixar films Monsters, Inc., Monsters University, and the latest Inside Out died at his home this past Saturday. Gerson was 49, and Variety reports, lost a battle with brain cancer. Gerson also received writing credit on Disney’s Big Hero 6 and voiced the desk sergeant in that film. Fans of Pixar may also note with delight and sadness that he lent his voice to the hilarious pair Needleman and Smitty in Monsters, Inc.
Gerson graduated from Cornell University with an English degree and worked on NBC’s “Something So Right” as a staff writer following graduation. He’s survived by his wife and parents as well as two children. No doubt Gerson’s death is keenly felt at Pixar and Disney. He played an integral role in bringing some of the greatest animated films to life. Donations in memory of Daniel Gerson can be made here. We want to extend our deepest condolences to the Gerson family during this difficult time. It’s Inside Out week! The highly anticipated flick opens nationwide this Friday, June 19th. This writer has seen it twice, and to echo much of the praise it has received, it’s a masterpiece. An all access screening was held yesterday three days ahead of the film’s release in theaters all over the country. We hope our incredible readers were also in the audience! This all access screening included a behind-the-scenes visit at Pixar as well as a Twitter Q&A session with Pete Docter and Amy Poehler (Joy), who are currently in Australia as part of the film’s press tour. Those in attendance received a free poster as well as a lanyard and Inside Out badge which grants access to more goodies online at Disney Movie Rewards! 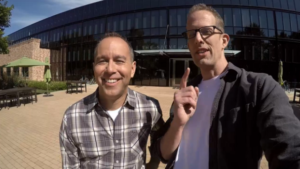 The tour of Pixar, with Pete and producer Jonas Rivera as hosts, was awesome. There was lots of Inside Out artwork and storyboards, as well as Docter and Rivera sharing their labor of love and all the time and research that went into it. The two of them always bring warmth and camaraderie, and the same was true here. I can’t think of any other people who would be more qualified to give a tour of Pixar! (Besides John Lasseter of course). In the Story Corner, which is a wall papered with numerous story sketches from various Pixar films, is a tribute to the late, great story artist, Joe Ranft. Regarded as the soul of Pixar, and a hero to many in the animation world, his influence is still deeply felt at Pixar. His sketches of what happens in a story meeting is framed on the wall, and it was such an enjoyable and sweet addition to the tour. Highlights from the video included “running” into some favorite Pixarians, such as Ronnie del Carmen, Inside Out‘s co-director, who Pete praised. He let the audience know how great del Carmen’s contributions were, and that if we loved the movie it was thanks to him, and if we hated it, it was thanks to him! (Definitely only the former). Afterwards we dropped in on Pete Sohn and The Good Dinosaur team! He informed us that 1/8 of the crew was present, and we got to see one shot of animation being finaled. Sohn gestured to the animators in the room, listing the beloved Pixar characters they’ve animated and brought to life. There will be so much more to see of this movie ahead of its November release and we can’t wait. The Good Dinosaur‘s original director Bob Peterson even made a cameo, informing Pete that his Roz voice was his regular voice. The audience loved it, as well as his Dug impression. It was especially wonderful to see Peterson and we can only hope he’ll be sitting in the director’s chair again soon. (You can even spot his name in the credits to Inside Out). We got to see John Lasseter’s famous office, a toy collector’s dream. The big man himself wasn’t in his office, but Jonas and Pete found him in the story room for Toy Story 4, with some help from that movie’s co-director, Josh Cooley. John very funnily hid the room from the camera, and did his best to “shoo” us away. The development on this film is highly secretive, but John promised we would know more in time. He also got to show off his Inside Out Hawaiian shirt! This video, which ran just under twenty minutes, was an excellent preview before seeing Inside Out. Heading into Pixar via cameras is often the only way to get inside, and all that positivity, humor, and cheerfulness never disappoint. We also get to see just how collaborative things are over there. It’s always a team effort when making a Pixar film, and the whole team is lauded for their contributions. Following the film was the Q&A with Pete Docter and Amy Poehler via satellite. They were both exuberant and definitely not short on praises for the other. Amy mentioned the collaborative spirit at Pixar and got a lot of laughs at our screening. When asked which emotions guided her as a young girl, she said that she was carefree and joyful like Riley, but with some anger as well, owing to her Boston roots. That inspired some cheers from us fellow Bostonians! It’s obvious why she was chosen to play Joy, but Pete explained that Joy was a tough character to write. At preview screenings, audiences loved the movie but hated Joy or found her annoying. Luckily, Amy’s performance saved the day; Joy is flawed but still lovable. She took cues from Tom Hanks’ performance as Woody to help her with the character, and it pays off. For those who have seen the film, the parallels between Joy and Woody are certainly there. Check back here for our review of Inside Out, as well as the short film, “Lava”! This has been a rough few months for Pixar’s artists. 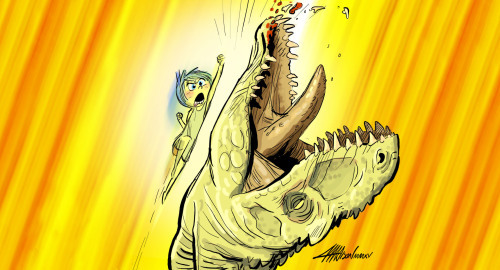 Hot on the heels of Pixar Canada’s closure last month, the studio’s headquarters in Emeryville will be laying off nearly 5% of its staff due to The Good Dinosaur‘s delay. An official statement reads: "At Pixar, we are constantly re-evaluating the creative and business needs of our studio. With the release date change of The Good Dinosaur, we have realigned our production and support priorities, which includes a small reduction in our staffing levels." The Pixar Times theorizes that the bulk of the layoffs will be focused on technical departments, which will be left without a major project to work on until Inside Out and The Good Dinosaur are closer to completion. Regardless, it’s very sad news, especially for a studio that has prided itself on keeping layoffs to a minimum. Stay tuned for updates on the situation as they come. As the year comes to a close, the excitement surrounding Brave and other 2012 Pixar releases is settling down; all that’s left is the December 19 release of Monsters, Inc. 3D. Nonetheless, a few worthwhile Pixar stories have made the rounds recently. Enrico Casarosa Unveils La Luna Statue: Following his previous tease, La Luna director Enrico Casarosa recently tweeted a first look at a maquette based on the short’s lead character, Bambino. Just 500 will be available exclusively at the Pixar studio store next month, and a wider release is unfortunately unlikely. Pixar Visit 2011: The 25th Anniversary Soiree! The much anticipated continuation to the Cars 2/Pixar Visit 2011 series is here: The Soiree. Before any of the bloggers and I could see any footage or hear the most intricate details about Pixar’s upcoming sequel, we were instructed to report upstairs for a reception. Not unlike the year prior, we weren’t surprised that Pixar had set up an introductory station. I think I speak for everyone when I say that we were shocked when we realized what we had stepped into. Pixar was not only holding a Cars 2 press event, but a "soiree" (as it was described) in celebration of Pixar’s 25th Anniversary. The guest list: just about anyone who’s anyone at Pixar! A little background information: This year, a big burden was taken off from the blogger’s shoulders as photographer extraordinaire, Deborah Coleman, provided many of the images that we might have otherwise (unprofessionally) taken ourselves. Please note that all of the images in this post are copyright Disney/Pixar and Deborah Coleman. Onto the reception— the first person I was able to shake hands with was Pixar President Ed Catmull. I always seem to keep my cool (for the most part) with everyone else, but as with the year prior, I couldn’t help but be a little starstruck when around one of Pixar’s "founding fathers." After that initial shock (don’t worry, I’m exaggerating), we met up with directors from the studios’ history. In particular, it was great meeting Pete Docter for the first time— what a cool dude. You’ll see myself, Pixar Times’ Samad (behind me) and Pixar Talk’s Greg chatting it up with the Doc himself in the picture to the right. It was also great seeing the always cool Jonas Rivera and the hilarious Bob Peterson again at the reception. Many of the shorts directors were present as well. Highlights include meeting Dan Scanlon (at the time, we did not know that he would be directing Monsters University) and chatting with him about his work on Mater and the Ghostlight. Pete Sohn, Ronnie del Carmen and a host of other personalities were also a pleasure to meet. 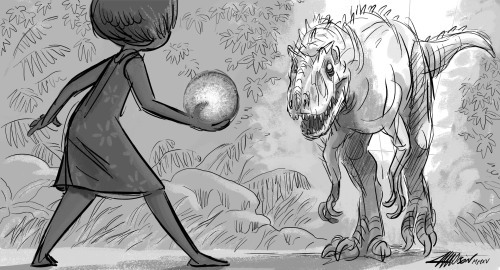 The women of Pixar are some of the coolest, though. Darla K. Anderson and Katherine Sarafian told us a little about what it’s like working your way up to becoming producers at the studio. They were immensely kind— and funny too! The common denominator about the folks at Pixar is that everyone is so down to Earth. During the soiree, you could feel the collaborative energy and pride that comes with working at the studio. Feel free to ask any questions about the soiree. Please keep in mind that reviews and interviews are embargoed until June so there is a limited amount of information that I can share. Note: For a more general idea of our visit, check out our preview post. See who else you can spot! Pixar joins a growing voice of hope for LGBT teens with their own submission to the "It Gets Better" project. Each and every one of the Pixarians featured are part of the LGBT community. If you’re a gay teen, please know that it will get better— trust me. Please call The Trevor Project at 866-4-U-TREVOR if you or a loved one is in distress. Note: The point of this video is to help those in need of support, so please leave any negativity at the door. Thank you, Pixar! Words of encouragement?